Stenosis is a term that originates from the Greek language meaning a choking or constriction of space. When lumbar stenosis occurs the spinal nerves roots in the lower back become compressed triggering signals of pain. Along with pain, symptoms of weakness, numbness as well as tingling sensations may be felt radiating from the lower back, into the buttocks and down the legs. Physical activity tends to trigger these symptoms with more severity. Although spinal stenosis can affect any section of the back, seventy five percent of the time it will occur in the lumbar spine. Spinal stenosis of the low back is termed as lumbar stenosis but may also be termed sciatica if it affects the sciatic nerve. Spinal stenosis becomes increasingly dangerous if it develops in your neck or the cervical section of your spine. If stenosis is present in the cervical spinal canal it may compress the spinal cord itself, increasing the risks of developing major body weakness or in some extreme scenarios, paralysis. 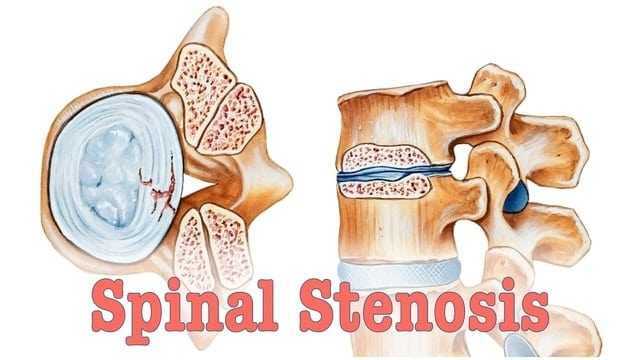 Because your spinal cord is not present in the lumber section of your spinal canal, paralysis caused by lumbar spinal stenosis is virtually impossible. The most common symptom of spinal stenosis is pain that radiates into your legs while walking. Relief from this pain is almost always near instant when sitting, but in rare cases, pain from spinal stenosis can be severe and persistent to the point where it causes constant weakness in the legs. Degeneration in the spine will often occur during the fifth decade of life for most people. Because there is such a strong link between degeneration in the spine and spinal stenosis, stenosis will also occur most frequently during this time period. Many people will not show symptoms of spinal stenosis until they reach the age of sixty, although in some rare cases traumatic injury to the spine may be the cause of early development. For the majority of cases spinal stenosis is not a medical emergency and will only impact the amount of activity you can enjoy. It is up to you the patient, to decide when you have had enough and seek treatment to lead a more active lifestyle. When reviewing statistics, we find that the age bracket most commonly affected by spinal stenosis in men and women is over fifty years of age. Although age is the main criteria when considering a natural occurrence of spinal stenosis, a younger person may be afflicted with spinal stenosis because they were either born with a narrowing of the spinal canal, or they have suffered from a traumatic injury to the spine. he human spine consists of twenty six bones that form a line or column spanning from the base of the skull to the pelvis. Of these bones, twenty four are classed as vertebra. Between each of these vertebra is a spinal disc that acts as a shock absorber and adds flexibility to the human spine. Five fused vertebra that make up the sacrum, spanning between the hip bones. 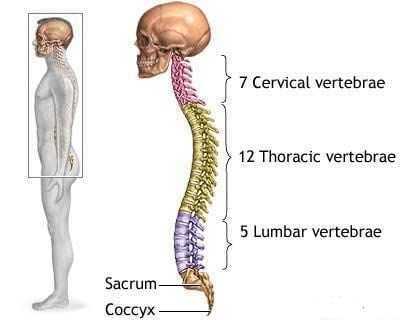 Three to five fused bones make up the coccyx located at the vertebral columns lower tip. Spinal stenosis often occurs as a result of natural spinal degeneration incurred with our natural aging process. Although spinal degeneration is the leading cause, spinal stenosis may also be caused by a herniated disc, osteoporosis or a tumor. If the spinal canal is not affected by spinal stenosis, there is adequate room for the spinal cord and the cauda equina. In some people, there is a curvature of the spine present, know as scoliosis, which applies pressure on nerves and soft tissue, as well as compressing or stretching the ligaments. We have already taken a quick look at some of the causes of spinal stenosis, here is a more detailed list of each cause. As the body ages, its ligaments begin to thicken. Small growths known as bone spurs may begin to develop protruding into the spinal canal. 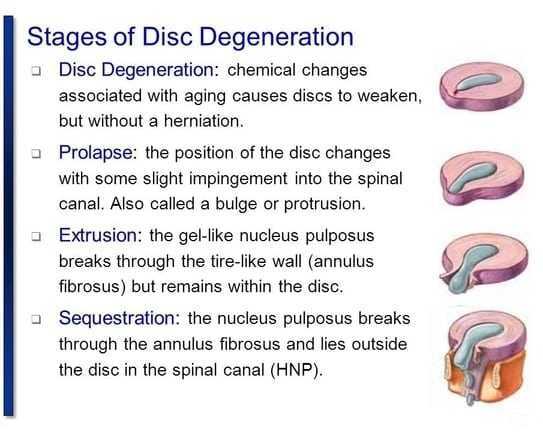 The chemical compound of spinal discs may begin to change, starting the process of disc degeneration. The facets joints which allow for nerves to exit may begin to break down as well. The above list all equates to the same problem; a restriction of space or narrowing of the spinal canal. This condition occurs when one of the vertebra moves forward onto another, narrowing the amount of space in the spinal canal. An abnormal growth that causes inflammation or protrudes directly into the spinal canal which is generally comprised of soft tissue. Osteoarthritis and rheumatoid are the two main forms of arthritis that can affect the spine assisting in the development of spinal stenosis. A small spinal canal can be passed on by the parents allowing for spinal stenosis to be present in a younger person. 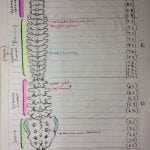 Narrowing of the spinal canal may also be caused by deformation of the vertebral structure. In some accidents or injuries affecting the spine, including dislocation or fractures, fragments may become present in the spinal canal causing a reduction of space assisting in the development of spinal stenosis. Spinal stenosis is the narrowing of passageways in the spinal canal that causes nerves to be pinched. Symptoms include leg—or more rarely, arm pain—numbness and tingling, and pain in the spine. If you’ve experienced these symptoms and are considering a visit to the doctor, here’s a little information on what to expect. When diagnosing spinal stenosis your doctor will likely perform one of two tests: magnetic resonance imaging (MRI) or an electromyogram (EMG). During an MRI, you lie still in a large machine for up to one hour while it uses a magnetic field to create detailed pictures of your bones, muscle and other tissues. An EMG is usually performed in two stages, although both are not always required. The first involves the administration of tiny shocks to a patient while electrodes on the surface of the skin record the body’s reaction. In the second stage of an EMG, thin needles are pierced into your muscle one at a time to record activity in the muscle. If you’ve undergone any of these diagnostic procedures and it is determined that you have spinal stenosis, your doctor will create a treatment plan for you. Depending on the severity of your condition, treatment could involve over-the-counter pain killers and anti-inflammatory drugs, physical therapy, or special exercises. If these are unsuccessful at easing your pain or you have very severe pain to start with, your doctor may recommend surgery. When considering how to treat spinal stenosis, you must begin with an accurate diagnosis. The most frequent symptom encountered when diagnosing spinal stenosis is leg pain that worsens when the patient walks. There may or may not be back pain associated with this leg pain. 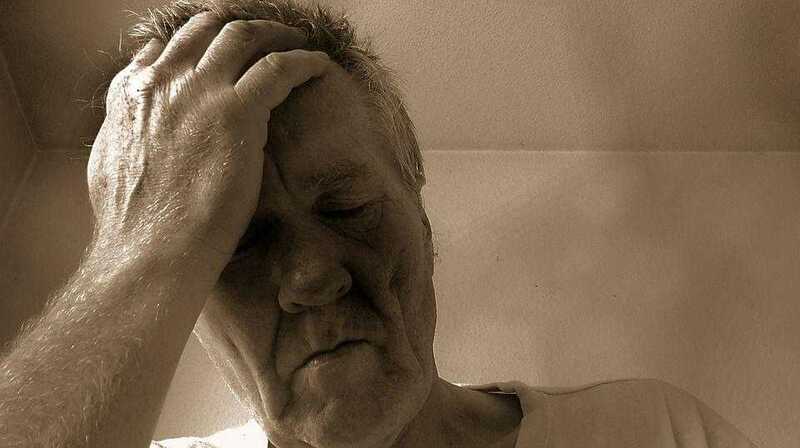 When a patient presents these symptoms to their general practitioner a conclusive diagnosis can be formed with the assistance of a MRI or CT scan with myelogram. A physical examination alone will not be able to provide enough evidence for a conclusive diagnosis. A key to successful treatment is an accurate identification of the type of spinal stenosis the patient is suffering from. The following are three major types of spinal stenosis. 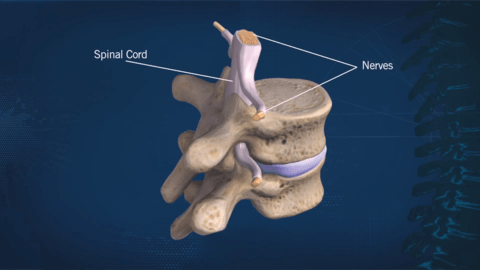 Once the nerve has exited the spinal canal it can be compressed by either a bone spur, bulging disc, or herniated disc. 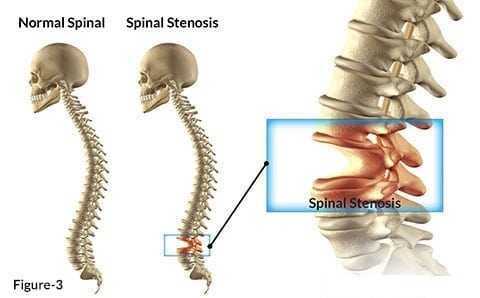 This is call Lateral stenosis and is the most common form of spinal Stenosis. The cauda equine (horse’s tail) is a bundle of loose nerve filaments. When the sack that contains these nerves is compressed it is termed central spinal stenosis. This form of spinal stenosis is most common at the second from the lowest lumbar spinal level and higher. This is most commonly caused by bulging disc or an overgrowth of ligament which is there to help protect the dura. 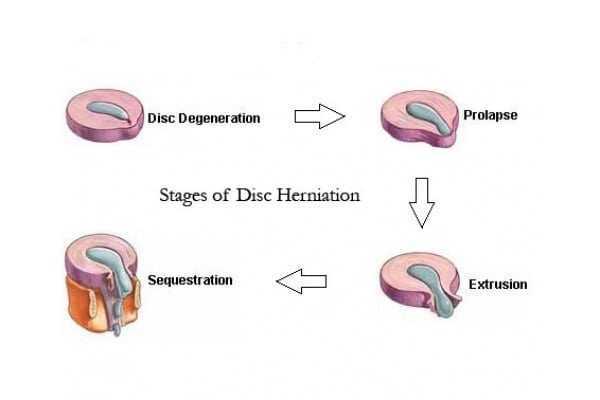 A degenerating disc will often cause this overgrowth. As the nerve root is about to leave the canal through a side hole (lateral foramen); a bone spur (osteophyte) that has already developed from a degenerating disc can press on that nerve root. 72% of cases of foraminal stenosis occur at the lowest lumbar level, trapping the emerging nerve root (which comprises a major part of the sciatic nerve). Most patients suffering from spinal stenosis will usually feel more comfortable flexed forward. The discomfort of walking can be eased by leaning on a cane, walker or shopping cart. Although exercise is not considered a cure, a physical therapist with a suitable exercise program can help to prevent any further debilitation that arises from inactivity. For obvious reasons that we have already covered, being seated and flexed forward on a stationary bike can be a good choice of exercise. A common symptom of spinal stenosis is inflammation. Anti-inflammatory drugs, such as ibuprofen or aspirin, may be helpful in treating spinal stenosis. It usually takes about fifteen to thirty minutes for these injections and they are administered in an out-patient setting. A needle is guided into the epidural space and once in position, the solution is slowly injected. Epidural injections use steroids as an anti-inflammatory agent, and often include a fast-acting local anesthetic for temporary pain relief. 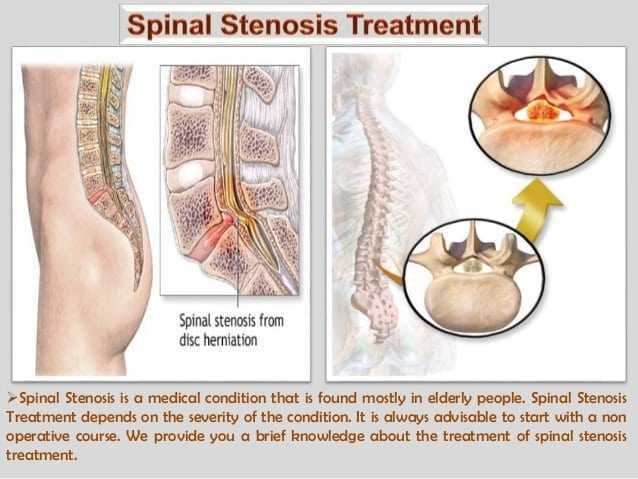 Most spinal stenosis cases will not require surgery and it is generally an elective procedure. It is up to the patient to decide when they have grown tired of dealing with the restrictions placed on their activities and seek surgical treatment. If you are unable to perform daily activities, or the quality of your lifestyle has been severely affected by spinal stenosis symptoms, your health care provider may recommend spinal stenosis surgery as the next step in your recovery. 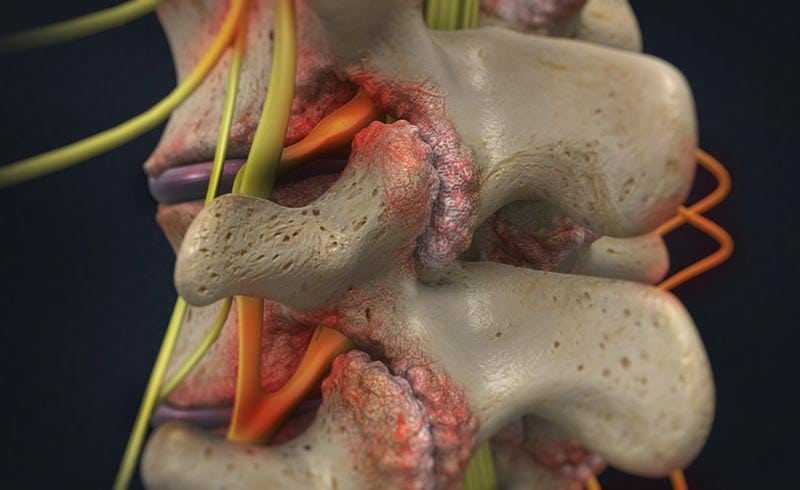 Surgery for spinal stenosis may also be recommended after 6 months of treatment without results to avoid permanent damage to the spinal nerve roots. Most experts agree that surgery has a high success rate for relieving pain and other symptoms associated with spinal stenosis. 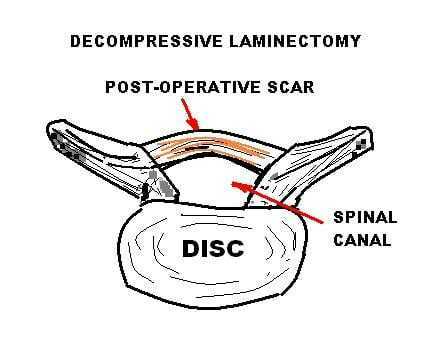 Decompressive Laminectomy: Narrowing of the spinal canal can be caused by bone spurs or thickened tissue. Spinal stenosis symptoms occur when narrowing of the spinal canal applies force or pressure on the spinal cord or spinal nerve roots. A laminectomy is a surgical procedure preformed to remove bone spurs or excessive thickened tissue, thereby removing the pressure and relieving the symptoms. Laminectomy surgery usually requires a large incision in the patients back. Although it’s dependent on the patients health, most patients that undergo spinal stenosis surgery will not return to normal activities for several months. Foramintomy: A foraminotomy uses an arthroscopic approach to opening the foramen without need of general anesthesia. It is performed to relieve the pressure being applied to a nerve by the intervertebral foramen. The foramen is the area in the vertebra where the nerve roots exit the spinal canal. Laminotomy: A laminotomy uses an arthroscopic approach to opening the spinal canal, thus being able to be performed without the need of general anesthesia or lengthly hospital stays. A laminotomy is a spinal stenosis surgery performed to relieve pressure caused by a narrowing spinal canal, increasing the amount of space available for the exiting nerve roots and spinal cord. The increased amount of space releases the entrapped nerves relieving the symptoms caused by spinal stenosis. A laminotomy is also a procedure used to remove the ligamentum flavum, a ligament in the spinal canal that can thicken to the point where it is actually compressing on the spinal cord, attributing to spinal stenosis. 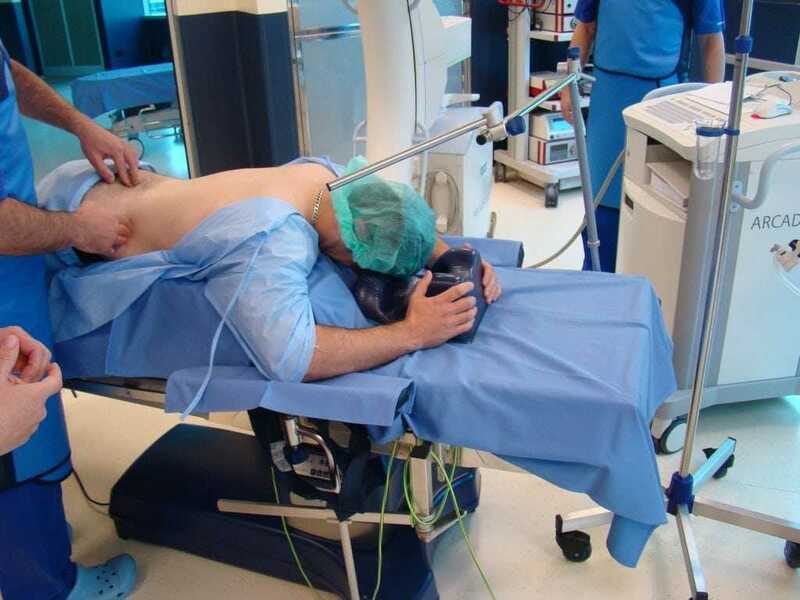 During the laminotomy most patients feel immediate relief to their symptoms as the nerves are released.